Clayton Kershaw was born my sophomore year of high school. For reasons that we need not get into here, I cannot possibly be his father. However, when he takes the mound — and especially when he takes the mound late in the game — and especially when he takes the mound late in a post-season game — I may as well be. The nerves I feel for Clayton are not dissimilar to those I feel when my own son toes the rubber for his JV team or when my daughter is astride the balance beam. My hope for them to do well is only surpassed by my desire that they not be in that moment at all. I sometimes wish I had taught them that life can be a spectator sport. I am, by nature, a pessimistic fan. I expect the worst to happen, and am only relieved when it doesn’t. I guess this is the product of a lifetime of Red Sox fandom and having the Arizona Wildcats as my alma mater. So I have no doubt that, at 7:30pm Friday night, when Clayton Kershaw takes the field, when he strides—in the words of Vin Scully—to the “loneliest place in the world”, the pitcher’s mound at Dodger Stadium, I will be biting my nails to the nub. It will be for the same reason that when Clayton gave up a lead-off double to David Freese in the bottom of the fifth inning of Game 2 of the 2013 NLCS, with the score 0-0, I got a pit in my belly. This “dad” knew something wasn’t right. Runner on second with no outs!? When Kersh struck out Matt Adams, it looked like he had a way out. But then there was an A.J. Ellis passed ball, and the air got a little cooler. A harmless (had the runner been on second) flyball made the score 1-0, which is where it stood when the 27th out was recorded. Who can forget October 3, 2014. Kershaw gave up solo homers to the second and eighteenth batters he faced; he retired all 16 in between (including seven Ks). The sixth inning ended with the Dodgers up 6-2. “Pull Kershaw”, this dad yelled from my kitchen, where I was helping prepare the Sandy Koufax-approved Erev Yom Kippur meal. Preserve the beauty of this performance and allow the bullpen to get the last nine outs. Alas, it wasn’t meant to be. We all remember the disaster that was that fateful seventh inning; the inning that, in many respects, defines Kershaw’s post-season career: 1B, 1B, 1B, 1B, K, 1B, K, 2B, BB, HR, 5-3. The top of the seventh ended with the Dodgers trailing 10-6, with Dodgers eventually losing 10-9. But Kershaw had a chance to atone not four days later in St. Louis, and he was ready: K, K, K / BB, DP, K / 3, 5-3, K / 7, 1B, 4-3, K / 8, 5-3, BB, 2-1 / K, K, K. Six innings, twenty batters faced, one hit, nine Ks, one BB. To this dad, it certainly seemed like he earned a hot shower and a cold beer. Yet again, it wasn’t meant to be. Kershaw trotted out for the seventh, and the pit starting forming in my belly. Matt Holliday (he of the 295 career homeruns to that point) led off with an infield single. By the time Jhonny Peralta knocked a clean single to center, I had a full-blown stomach ache. Then three pitches later, Matt Adams hit a 3-R bomb to right. Game, set, match, and season over; reputation cemented. 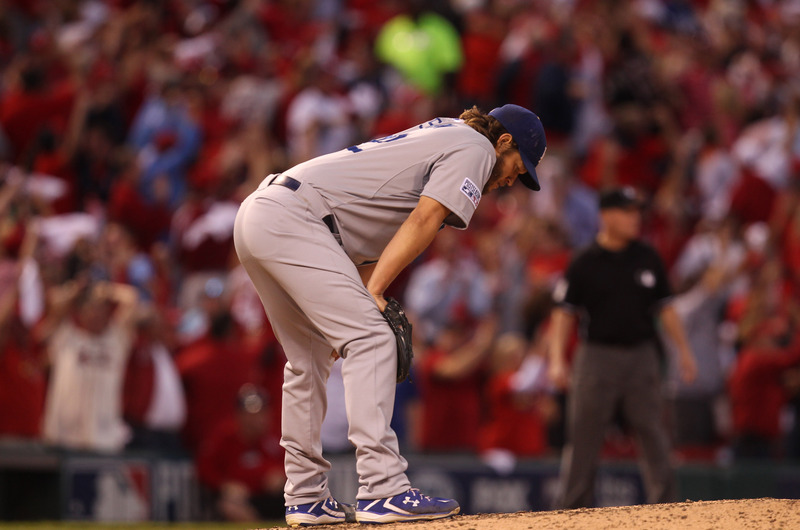 Kershaw had to wait another 367 days to avenge those two Cardinals games. In Game 1 of the 2015 NLDS, Kershaw had made one bad pitch (a homer to Daniel Murphy to lead off the fourth), but was otherwise cruising into the seventh (23 batters faced, 4 hits, 1 walk, and 11 Ks). But then he walked Lucas Duda to open the inning; and we all know about leadoff walks (I know that the actual statistics show a walk isn’t any likelier to score than a hit, but it certainly feels that way). A ground out and then another walk, and my Spidey senses were on high alert. Why couldn’t Mattingly have pulled him after six? Kershaw didn’t need to be out there for another trip through the order. Hadn’t he learned anything from the year before? Once again, I was no longer a baseball fan, I was a dad watching his son implode – in slow motion. In my alternative universe, this is when I would have excused myself from the stands and taken that long walk behind the bleachers, down beyond the dugout to watch this nightmare unfold in private – away from the prying eyes of the other parents, and where the coach wouldn’t hear me cursing him for keeping my kid on the hill too long. A Jacob deGrom sacrifice bunt followed by yet another walk, and Kershaw’s night was over. Sacks full with Pedro Baez in to save the day…fat chance. David Wright singled in two, and my boy took the loss. In this alternate universe, I prepared for our long drive home. It happened again a few weeks ago, in Philadelphia. Kershaw had retired 15 of the first 17 batters he faced, and had a 2-0 lead going into the sixth. But then Ty Kelly lead off with a walk (see above for that pit and that irrationally useless research). A pop-out (phew); single (uh-oh); K (nice); BB (uh-oh, again). This is when the baseball fan in me stepped back and said: “In 103 career chances, Kershaw has allowed five bases loaded doubles, and six bases loaded walks; but never a bases loaded homerun”. And then my inner monologue went to Aaron Altherr – a career .234 hitter with a total of 25 big league dingers – and I just knew Kershaw could retire the side and turn a 2-0 lead over to the bullpen. But, the dad in me was still nervous. Father knows best. When Kershaw hung a 1-1 slider and Altherr hit the ball 418 feet, and four runs scored, and the Dodgers now trailed 4-2, and Kershaw had been out there a few batters too long once again, and all the other parents in the stands were consoling me, I just knew it would be another long drive home. I don’t know why I have such a filial connection to Clayton Kershaw. I certainly don’t feel this way about Tom Brady, or Andrew McCutchen, or Steph Curry. I want them to do well, but I am not heart-sick about the prospect of them not. I don’t secretly hope Brady hands the ball off, or McCutchen draws a walk, or Curry passes up the big shot – I want them in there and I want them to succeed. Maybe it is because I believe – in my soul – that Kershaw has been the victim of bad luck, and a player of such great quality (both on and off the field) deserves better. Maybe it is because I want the best pitcher alive to always be the best pitcher alive. Maybe it is just because I am a fan, which is short for “fanatic”. I have no idea. But whatever the answer, I sit in the stands or on my couch holding the theoretical pillow, hoping to provide a soft landing for a grown man; a man with a wife and two kids; a professional athlete making more than $30 million per year. Which begs the question: What is wrong with me? I guess that’s what makes sports great – we love the game, and we love the players that we root for/idolize/lionize – literally – beyond reason. And so, when David Peralta or A.J. Pollock digs in for that first pitch of the NLDS on Friday night, rest assured that this dad’s heart will be in his throat. This post originally appeared on Dan’s blog, Baseball Craziness. Next post: Does Girardi Deserve the Boos?